The utilities sector delivers essential services 24/7, 365/365, and GRITIT is there to make sure it stays that way. GRITIT's track record within the utilities sector is second to none, and some of the largest sites in Britain choose GRITIT as its gritting, de-icing and snow clearance provider. The label 'utility sites' may cover anything from a small substation to an enormous depot, but they're all subject to stringent safety procedures and highly specific site requirements. 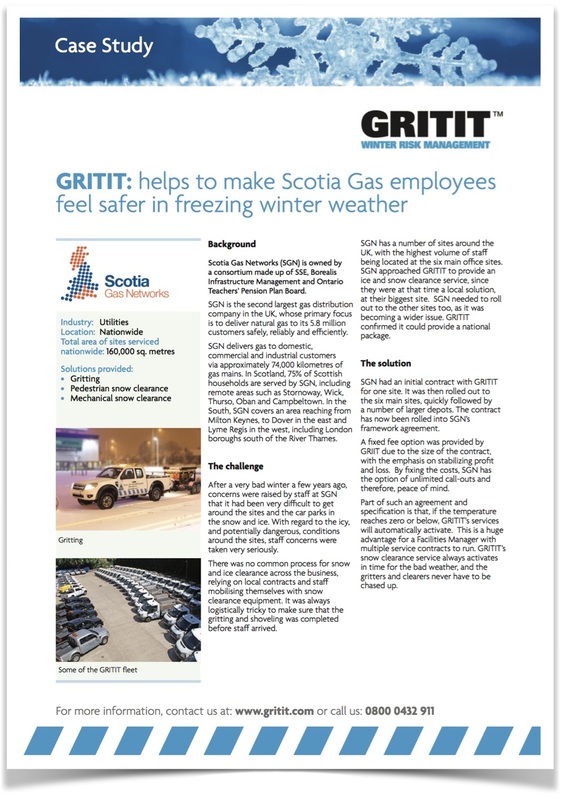 GRITIT has the experience, expertise and training to work with your operations, using such things as low corrosive salts for special storage -- and with the largest dedicated gritting fleet in Britain, the appropriate size of apparatus to be able to handle site access (ie avoiding overhead cables). Our versatility means we will always work with and for your operations team, scheduling our jobs around your planned train movements for example. Utilities are obviously critical industries, and as the quote from the CEO states above, our mission is to ensure that your operations are never interrupted. For the utilities sector, staying open is simply the prime directive; interruption is unforgivable. Interrruption due to inclement weather conditions for snow or ice means lost service, and ultimately lost business.... and to the tune of thousands of pounds every second. Being the industry leader means our operations are scaled, and have the inbuilt operational expansion and contraction flexibility. GRITIT's strength, based on client feedback, is that our teams can genuinely handle unpredictable emergency tasks, far over and beyond any usual proactive story. Part of this comes from our industry-leading technology stack; our communications with clients are personal, direct and highly responsive; attending whenever needed, trusted directly by local contacts and not just using Affinity or other depot software. GRITIT's absolute reliability keeps all your external areas safe 365/365, 24/7. We get that the time window of your operations are crucially important, we've done this for years throughout the country, from Land's End to John O'Groats. 3 AM snow clearance before the early shift starts? No problem!